Miwok 100k traverses the beautiful Marin Headlands up and down the foothills of mount tamalpias along the California Coastline. A few days before Miwok 100k I was discussing race strategy with ultrarunner Chris Jackson. My favorite athletes to coach are all self motivated and goal driven. Chris Jackson is definitely one of these athletes. 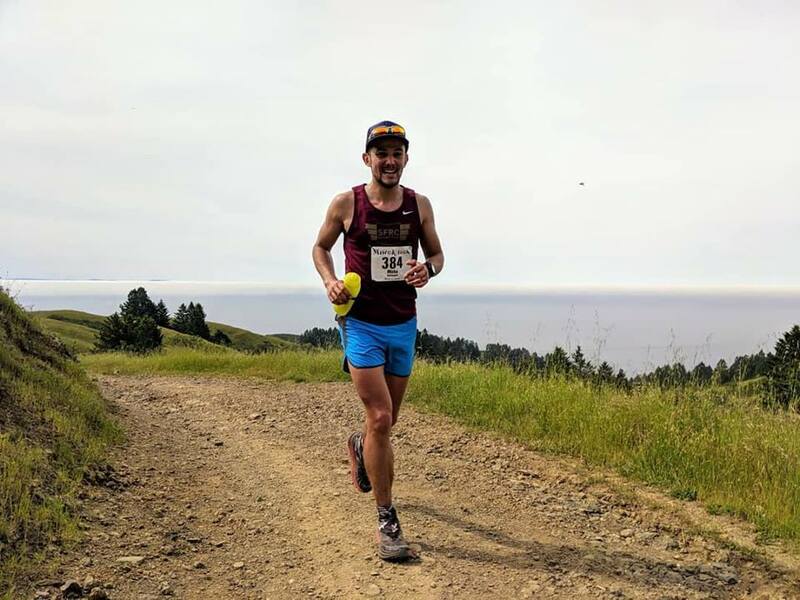 By coincidence Chris and I were both running Miwok 100k in 2018 as a Western States qualifier. At the end of our race strategy conversation Chris says "I am looking forward to getting to run with you." I thought this would be great, but having closely followed Chris' training over the previous 18-weeks, I knew my chances of keeping up with chris where pretty slim. "I will hang on as long as I can, but I am counting on you to crush me,"I replied. Just as planned, that is how the race unfolded. After a long back and forth game of chase with eventual winner Franz Van Der Groen, Chris Jackson finished close behind for an awesome second place finish. Chris' coach, true to his word, strolled across the finish line 38 minutes later to finish in 6th. Warning: there will be blood, there will be sweat, and there will be beers. In 2017 I set a goal of running Western States 100 mile. Those that have been familiar with the ultrarunning scene for awhile now know that getting into Western States is not likely. Without a qualifying race a runner can't even enter the lottery. In 2018 I planned to Make Miwok my qualifying race, I entered the lottery for Miwok and was pleased to find out I was accepted into the race. I love the chosen date for Miwok 100k for multiple reasons. First, may is an absolutely beautiful time to run around Marin County. The weather is awesome, the hills are green, and the flowers are blooming. The other reason May is a great time for a race is that you can kick off training on January 1st and make a perfect 18-week training cycle, so this is what we did. I designed the training for both Chris and I. After our first discussion I knew Chris was a better athlete than I, but I had built up a very solid base before jumping into this training cycle, with this in mind, Chris and I followed similar 18-week training plans, with individualized differences of course. Chris' training included multiple training races racing, the longest of which was Lake Sonoma 50 mile in early April. I had intended to get in a few practices races but consistently ran into scheduling conflicts making my longest race during training a trail half marathon done in January. Training was periodized starting with a speed development block during January, followed by a threshold development block through March, followed by a volume block, and of course a taper before race day. Though we both followed this rough plan, our training was individualized to meet our particular needs. Where Chris took a longer taper/recover starting after his Lake Sonoma Race, I would continue to build volume. I also had to tweak my own training after being sidelined for two weeks with illness and a back injury from an old snowboarding accident. The first week of training totaled 7.5 hours and we would build to about 14 hours on the biggest volume week. I have the luxury of training almost exclusively on trails which enables me to log plenty of climbing. Living in the heart of San Fransisco, Chris consistently logged higher weekly mileage but with less elevation change. This is the Advanced Training Plan Used by both Chris and Levi for Miwok. Chris had finished third at Miwok in 2016. This year Chris intended to win. I certainly was not going to stand in his way, however 2017 winner, Franz van der Groen, had no intention of finishing in second. Chris' strategy was to stick with Franz from the start. This would be the 3rd race of the season in which Chris and Franz would race. In each of the previous races, Franz would eventually end up besting Chris by about 4 minutes. We estimated that Chris would need to average 6.5 miles/hour to run his best race. To keep with Franz that speed might have to increase to closer to 7 miles/hour. Having coached Chris, and being friends with Franz, I recognized that a win for me would be unlikely. My plan would keep my word to Chris, run with he and Franz as long as I felt comfortable then wish them well and see if I can hang on for a third-place finish. I would attempt to average 6.5 miles/hour for the first half and stay faster than 6 miles/hour as even as distance takes its toll. The Miwok route is quite convenient when it comes to fueling strategy. For front-runners, aid stations are each placed approximately 1 hour apart. We each would plan to eat 250 calories/hour. 200 calories would come from gels that we would carry with us, the other 50 calories would come from aid stations. At each drop bag opportunity, we would drop our trash and grab all the fuel we needed until the next drop bag opportunity. Chris prefers to stick mostly to race gels, I like a combination of gels, baby food packets, and Clif bars. 5 AM, the race starts right on schedule. A centipede of headlamps makes its way up the famous Dipsea Trail. Despite this being the steepest climb of the race everyone starts at a pretty solid pace. I settle in at the 10th position. Chris I thought was behind me (as the sun comes up I discover that is him up there in 2nd position just as we had discussed.) As we reach the apex of the first climb runners are greeted with the sounds of bagpipes greeting the sun which was just beginning to peek above the horizon. I arrived at the Muir beach aid station (best volunteers ever) in third place just in time to give some high fives to the leaders as they departed. Though I managed to hold 3rd place until after mile 20, this is the last time I would see the leaders until the out and back at about mile 50. I would hold the 3rd place position until about mile 21 when Phil Kochik and Misha Shemyakin casually strolled up on me chatting away. To be honest, I was a little relieved to see them. Misha is a fellow Marin local and I have raced with him many times in the past. I know that if I am leading Misha I am likely going too fast. It was great to have some conversation over the next few files. Turns out Misha recently moved about 1/2 mile down the street from me. He has a toddler. I have a toddler. Dad high five. Let's get the kids together at the park for a playdate. Blah blah blah blah blah, oh yeah, racing. By the time I reach the Tennessee Valley aid station (best volunteers ever) I had fallen to 5th, and in my haste to make up time head out of the aid station headed the wrong direction. After the kind volunteers point me back in the right direction I do manage to regain 3rd, but fall back to sixth over the next few miles as my pace begins to slow while the pace for Misha, Phil, and Jean Pommier remains consistent. I cross the 50k mark at 4:26:00. Just ahead is a five-mile climb up heather cutoff to Cardiac aid station (best volunteers ever,) then the climb continues for a few more miles to Bolinas Ridge. Though this climb is long, it is not steep and with fresh legs is very runnable. I did not have fresh legs. I walked much of this climb. Though I would have preferred to have the energy to run, the slower pace allowed me the opportunity to really take in the views as this trail is beautiful. At Cardiac I enquire about the leaders and learn that Chris had come in about 2 minutes ahead of Franz. A few miles down the trail I managed to overtake Phil who was not impressed and simply stays on my shoulder until I eventually had to stop and gasp for air. Well played Phil. I skip the snacks at the Randall Aid Station in favor of the 250 calories of sweetened caffeinated beverage I knew I had waiting for me in my drop bag. This was probably a wise choice as I would later learn that the Randall aid station (best volunteers ever) had sausage on the menu. Such a tasty treat could keep me at an aid station for hours. I walked every step of the final climb back to Bolinas Ridge. My slow pace did not go unrecognized by Robert Verhees who used the oportunity pass me by. I symbolically tried to run with him as he passed, but that only lasted a few seconds. I managed to run most of the final descent back to Stinson Beach eventually overtaking Jean Pommier who was facing some cramping issues. In the end, I am very happy to be able cross the finish line in 6th place, and I immediately catch up with Chris to congratulate him on his new personal best. Chris would finish 2nd place with a new 100k personal best of 9:30:01. I offer to buy Chris a post race beer only to learn that the swag bags come with beer included. It would seem the race director has thought of everything. This was a great race, on a great course, with great people. I see why Miwok has become so popular for so long. I hope to see you out there in 2019. Looking for more Miwok 100k Information? Check out Jean Pommier's Race Report.